I have had an epiphany… a light bulb has flashed on in my head… It is a doozie of an idea… A truly inspired idea. 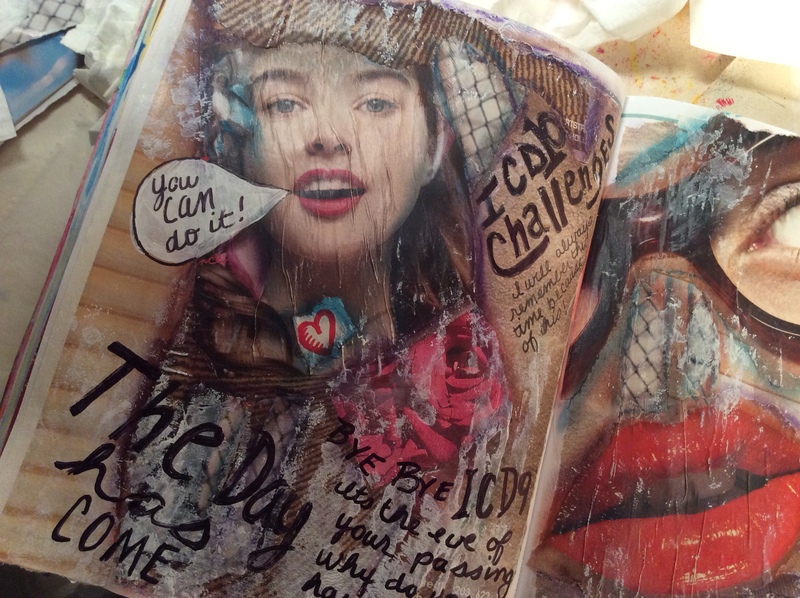 A fabulously amazing idea… if I can only figure out how to do it! What am I ranting about? The merging of two fabulous tools into one. 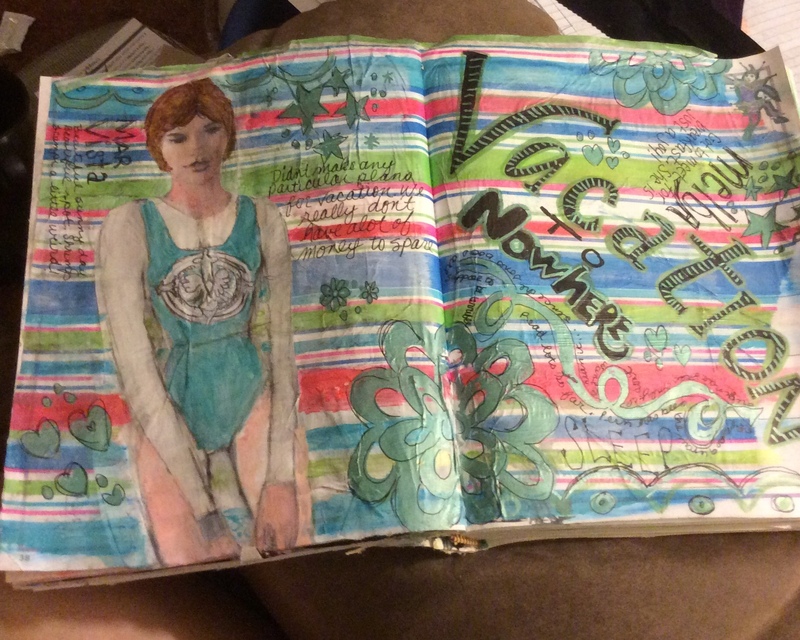 Homemade art journal pages and a Midori-like cover. So what is the big deal. 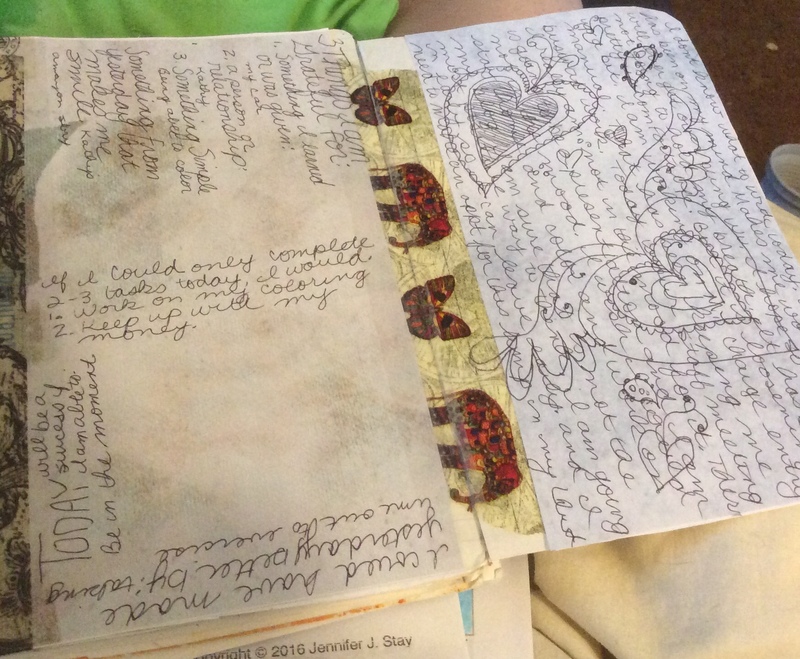 Well, first off, I like journaling in one book. But it never ends up that way. I always have extra paint and need to slap it down somewhere (other than the current page I am working on in my current journal) or start a new class and want a separate place for that, or don’t want to wait for current project to dry so I work in another journal… The point is, I always end up with many partially filled or newly started journals lying around. I hate that. I happen to like keeping my work in a pseudo-datelike order. 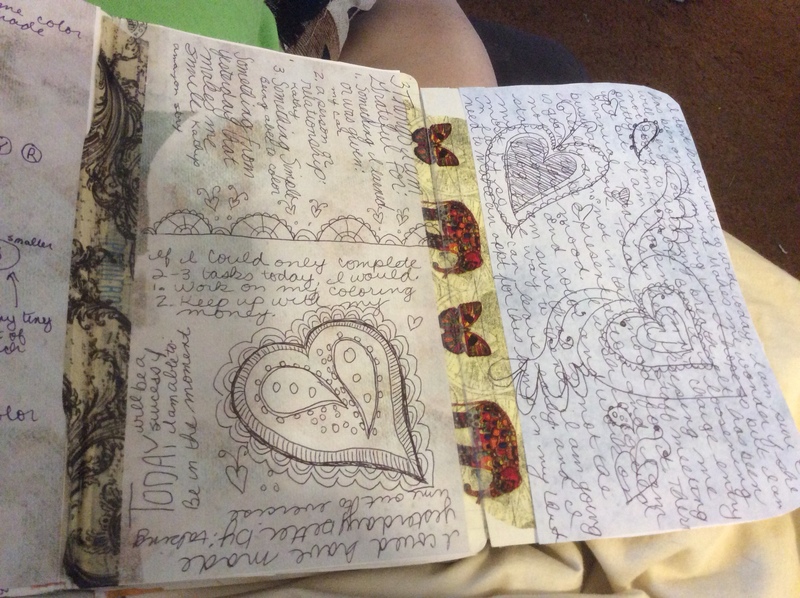 Having so many different journals makes keeping similar dates together almost impossible. 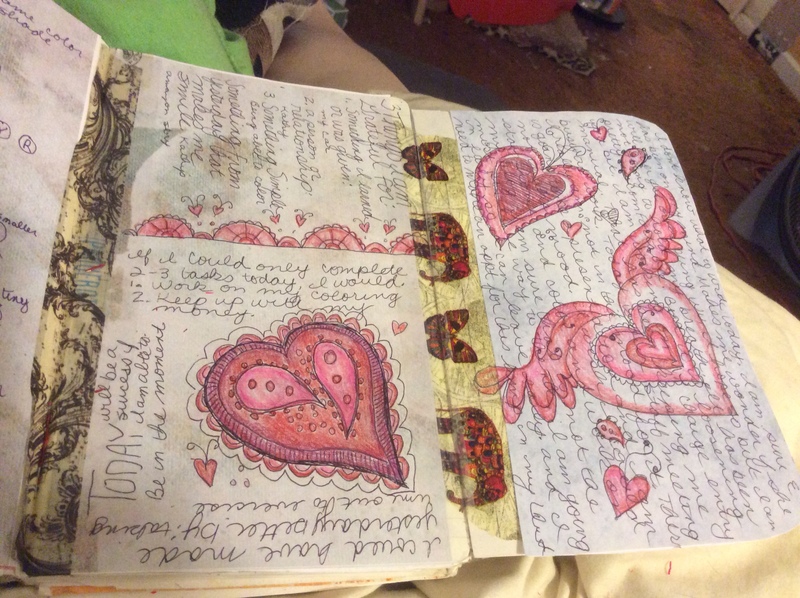 I also do not like having partially filled journals all over. 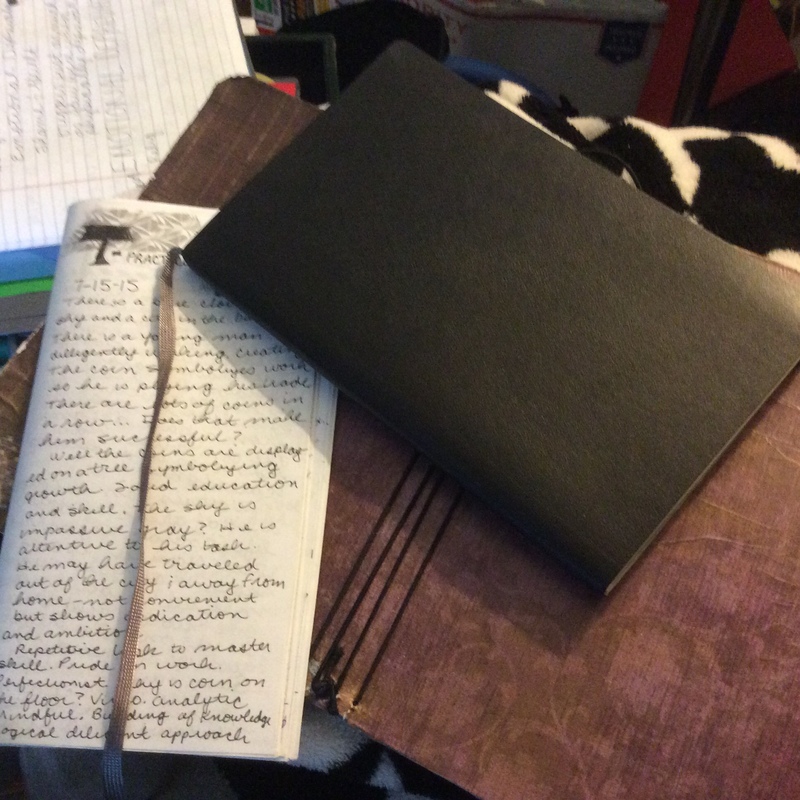 It is more a mind thing, so many partially filled journals makes me feel like I can’t complete anything (yes, I know… I am doing the work, why does this matter… but it does in my brain). 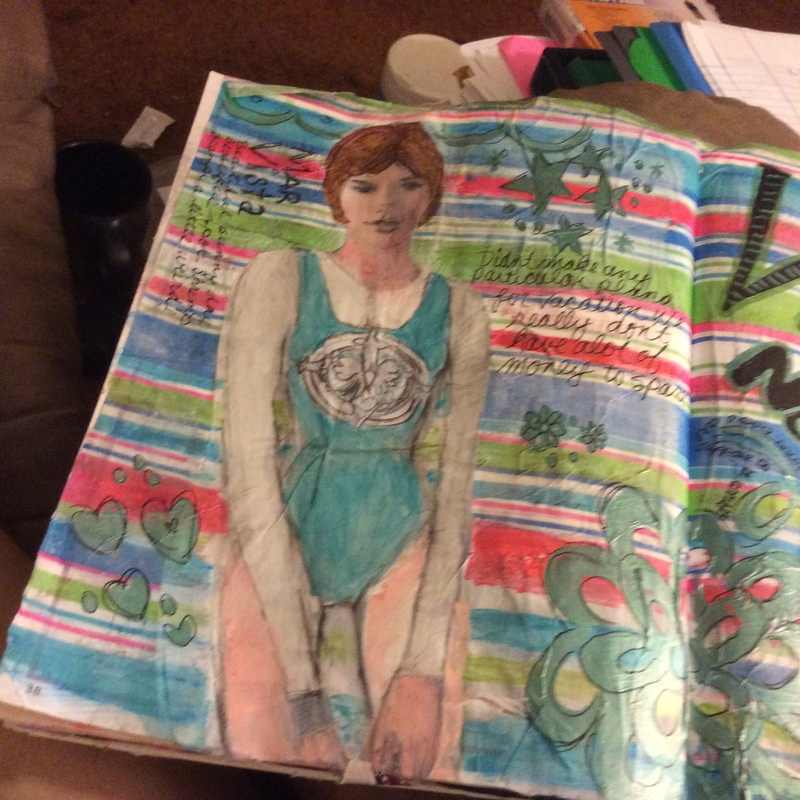 Second, making an art journal can be a pain! 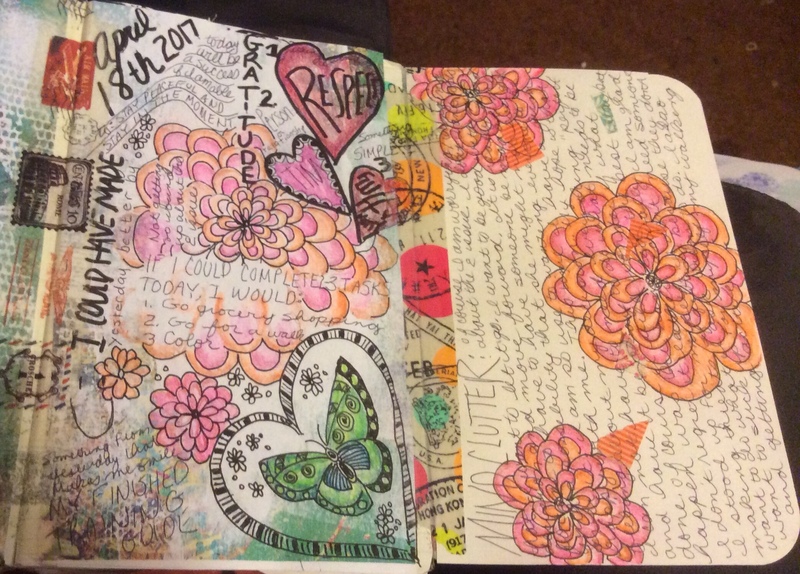 When I started out art journaling, I just knew I would NEVER be interested in making a journal… certainly not when I can just buy one. 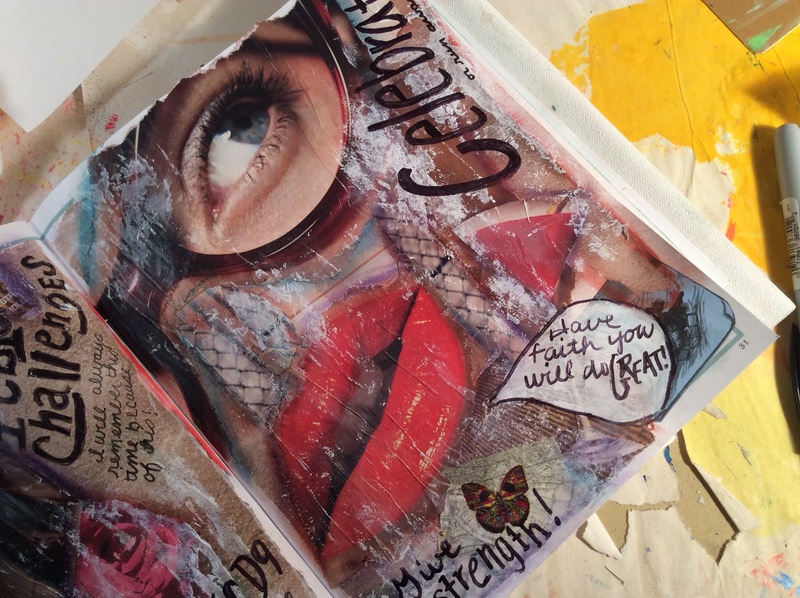 Years have past and I have made a few journals now… but the fact is I do not like fooling around with binding – which most of the time seems to be the main part of making an art journal. I don’t like the sewing and the awl poking and all that fooling around. I have done it but I don’t like it. 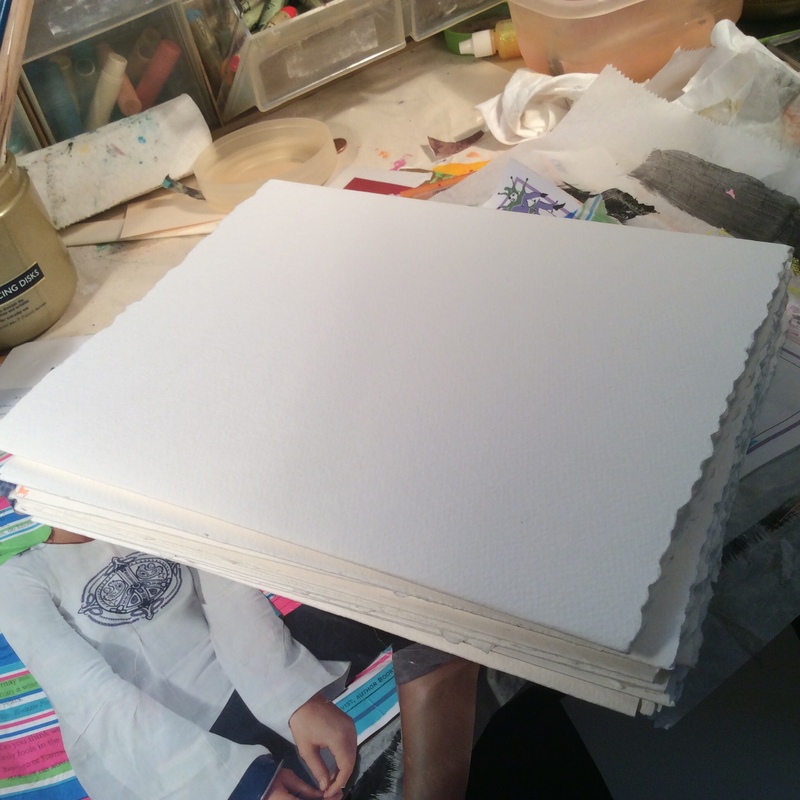 Third, sometimes you just want to work with journals with different size papers… maybe an entire journal with smaller pages, or a journal with all sorts of different size pages (which generally you can’t buy and have to make). 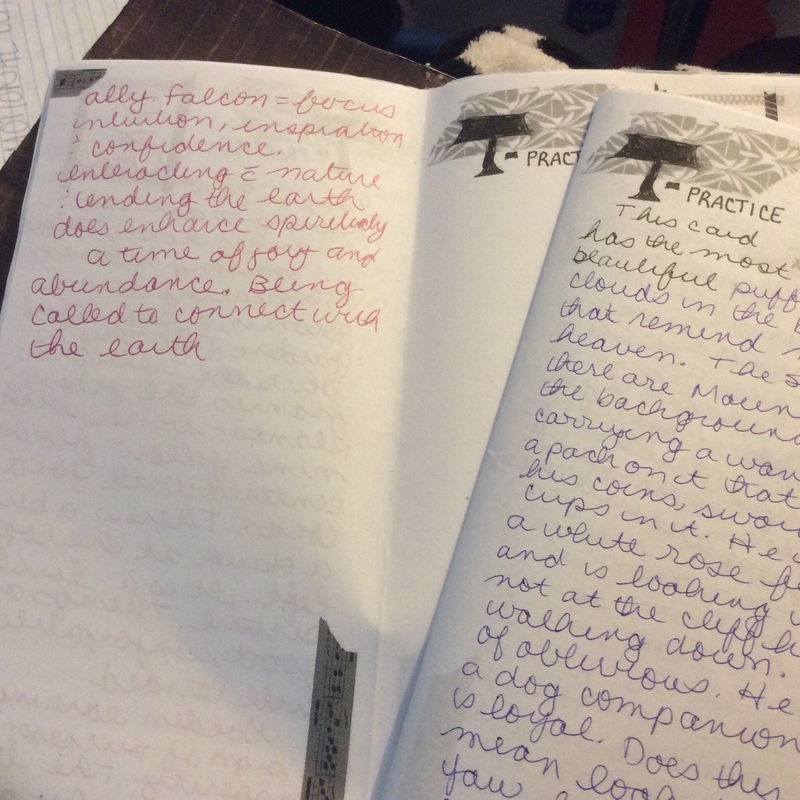 So you are left having to start another journal — one you had to hand make to get the paper and sizes you want. 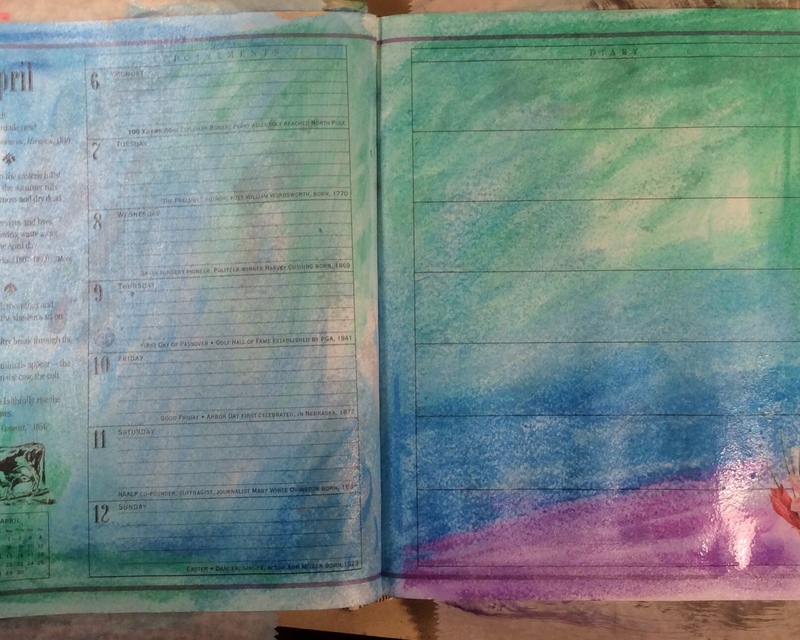 Fourth, sometimes you would like to keep a lined notebook (composition book) journal along with your art journal for notes and such – especially if you are taking a class. Fifth, sometimes working in a bound journal is a real pain. 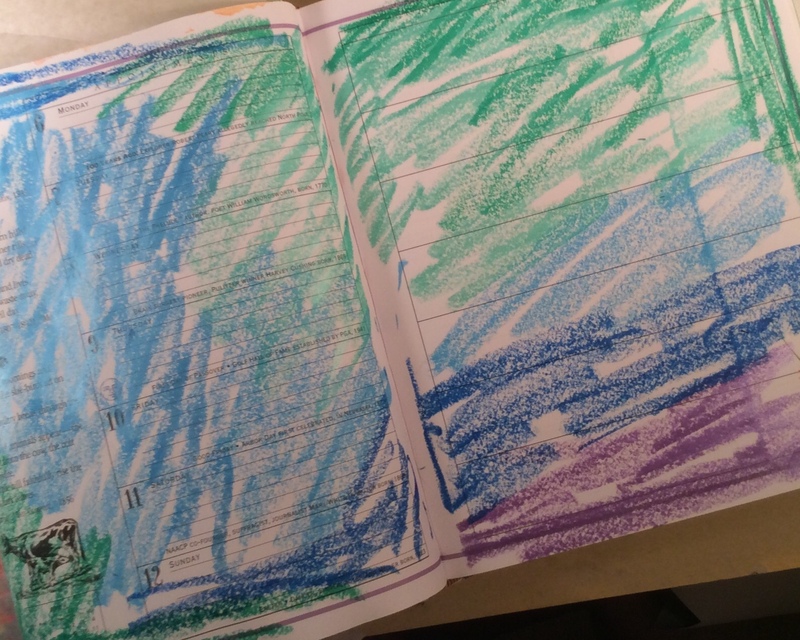 You have a gutter between your two spread pages to deal with… and because it is bound you are limited as to the page order. By this I mean, once it is down it stays were it is. 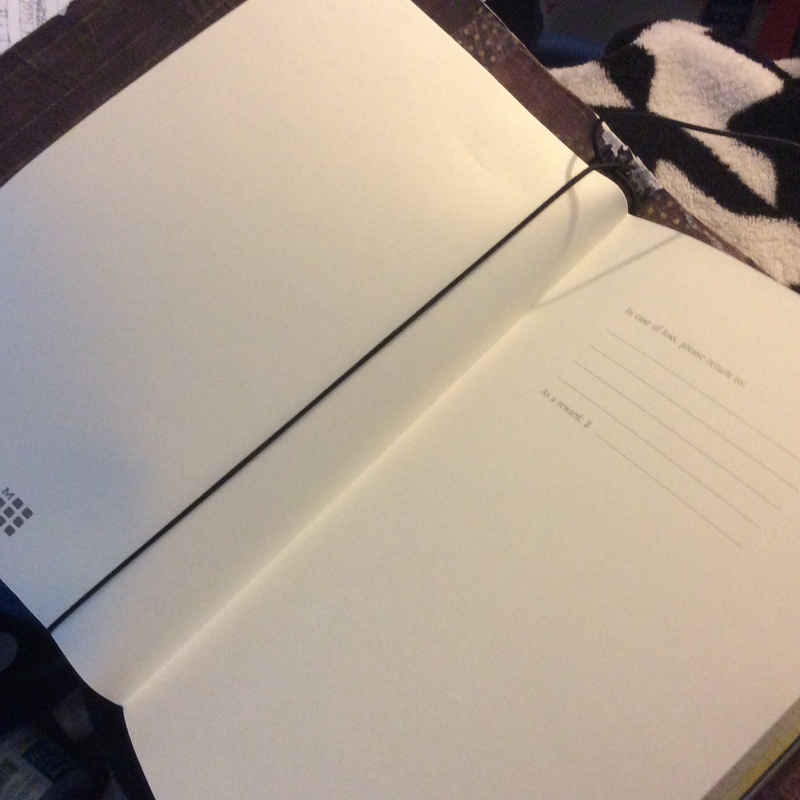 It is not like a loose leaf kind of notebook (or even a spiral one where you can take the spiral off and then reinsert it once the journal is done) where you can take pages in and out. The answer to all of the above is a Midori-style cover that can fit all your journal books, lined notebooks, and art paper pamphlets. 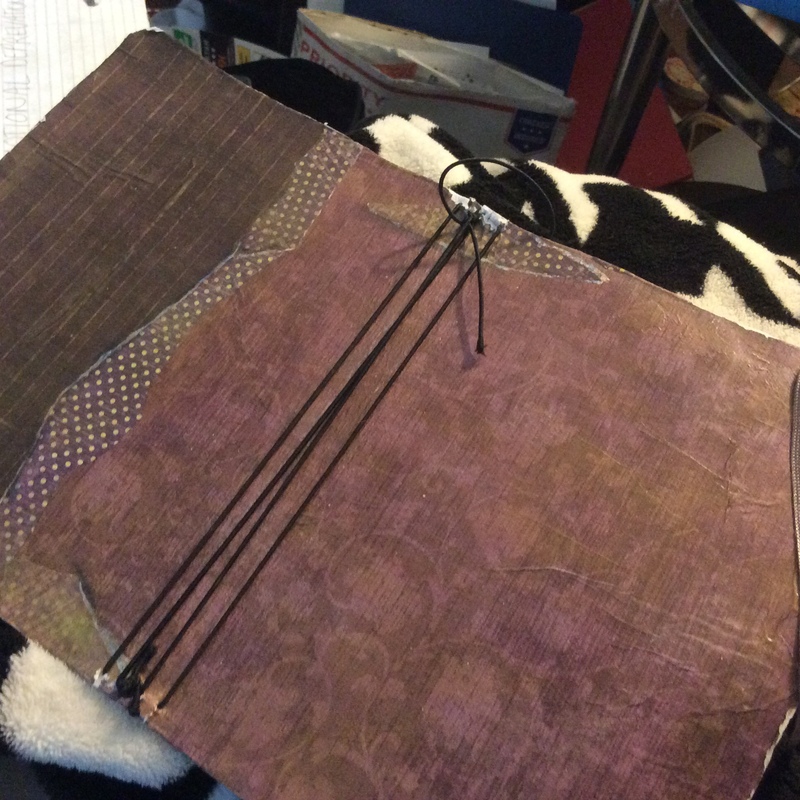 If you have never heard of a Midori journal, it is a cover that has two or three elastics running from top to bottom inside the middle “binding” area. 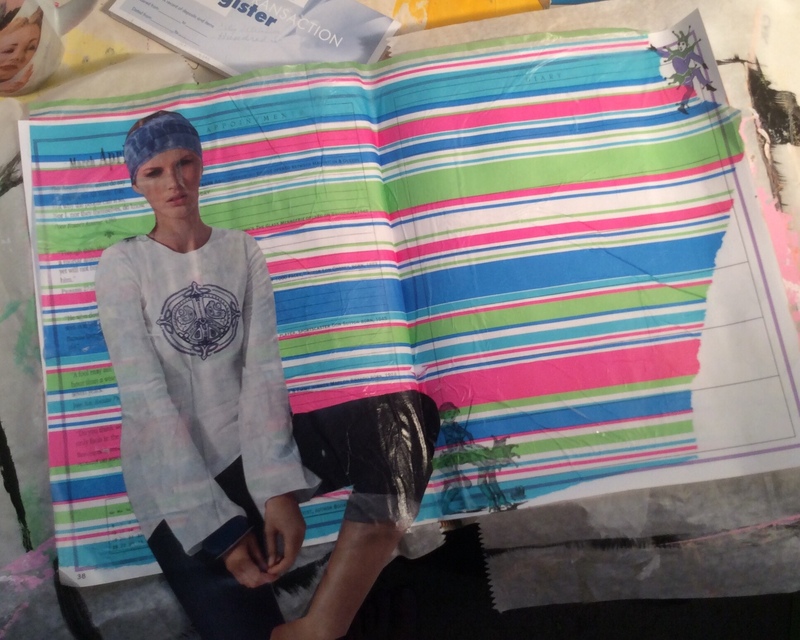 You slip a journal or pamphlet under one or two elastics and that holds it in place inside the journal cover. Typically they are pocket-sized and used for written journals, appointments, planning, and sometimes art journaling. What makes them unique is that you can buy or make all different kinds of pamphlet inserts. 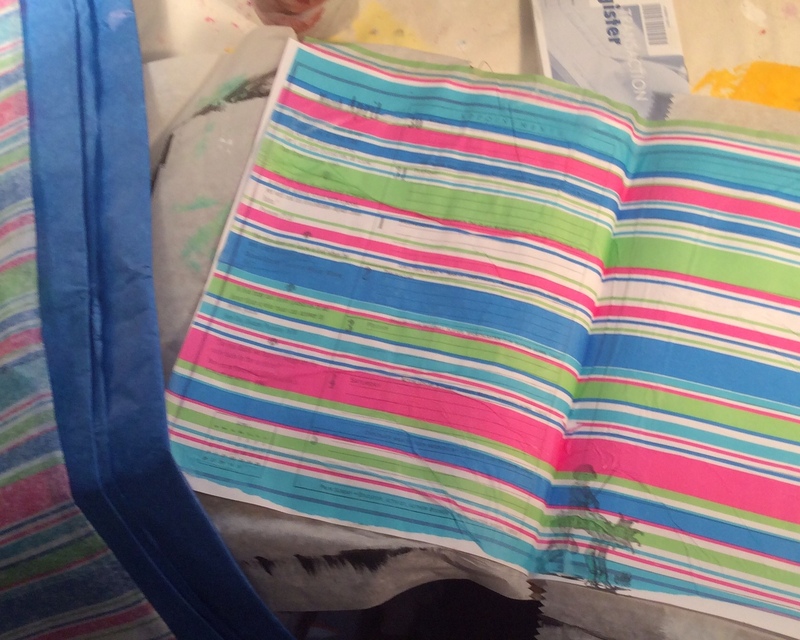 Now if you could get a really big Midori… one that would fit your art journal and/or art journal paper… with lots of elastics…. you could have a cover that would fit all our journals and journal paper inserts. You could put several all in one bound type book. All you need is a Midori-like cover that will fit your biggest journal or journal paper inserts. 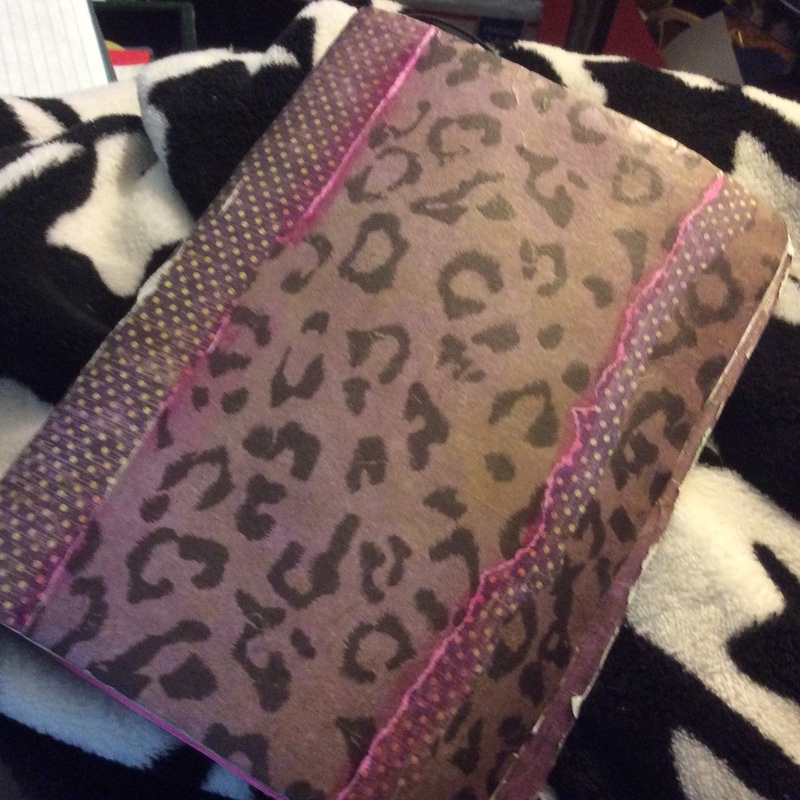 This is a Midori-style cover I made for my Written Journaling. This is the inside with the four elastics running from top to bottom. This one has a pamphlet insert and a Moleskin elasticized inside. The pamphlet pages are just nested, not bound together at all. The elastic does all that work. 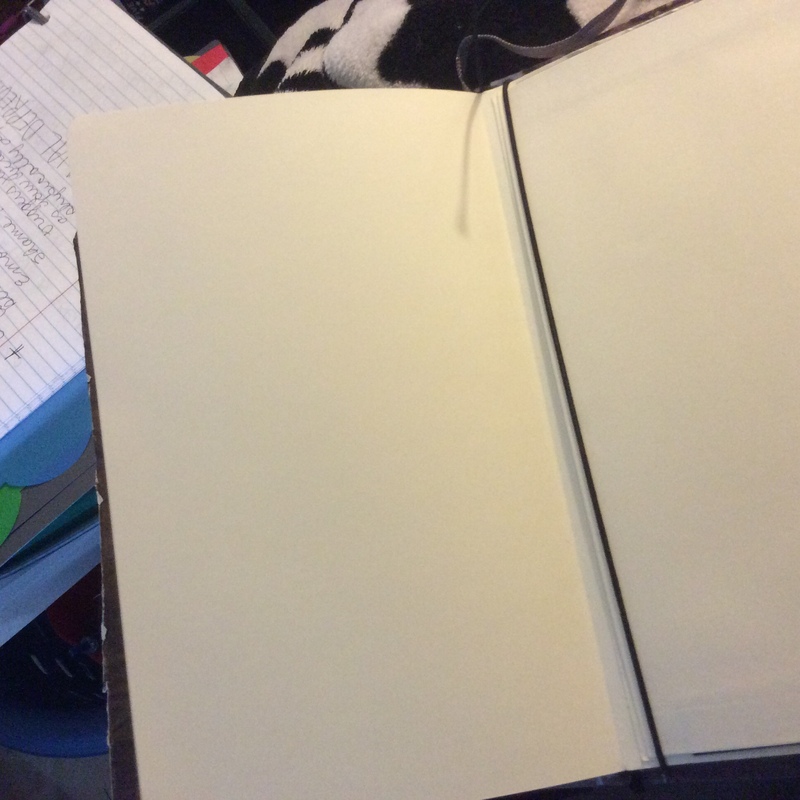 I attached the Moleskin with one elastic in the front cover and one in the back, that held the big book in nicely. If I could figure out how to make this, I would make at least two covers from the start. 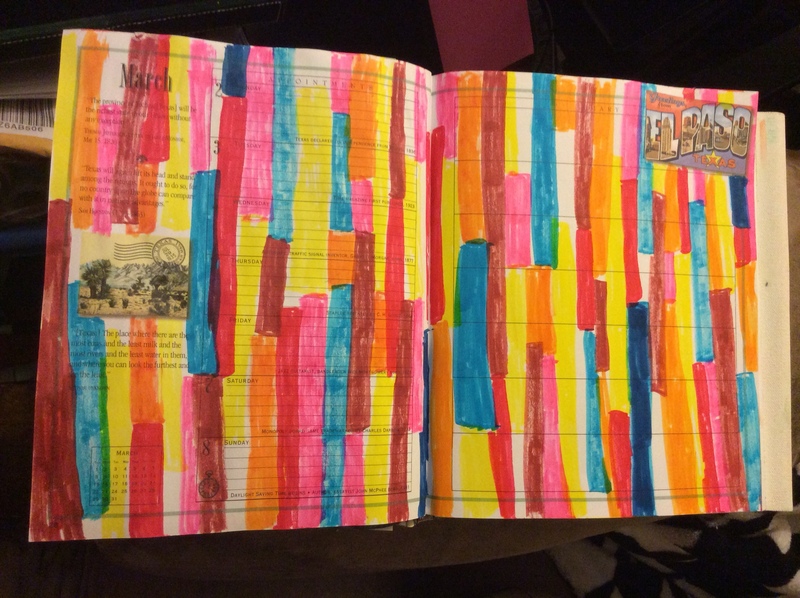 For my first Midori-like cover, I would put in my Journal Page Jumble. It is pages from multiple journals that I have three-hole punched and bound together with three silver binding rings (my past answer to the above problems – and not a very satisfactory or pretty answer at that). 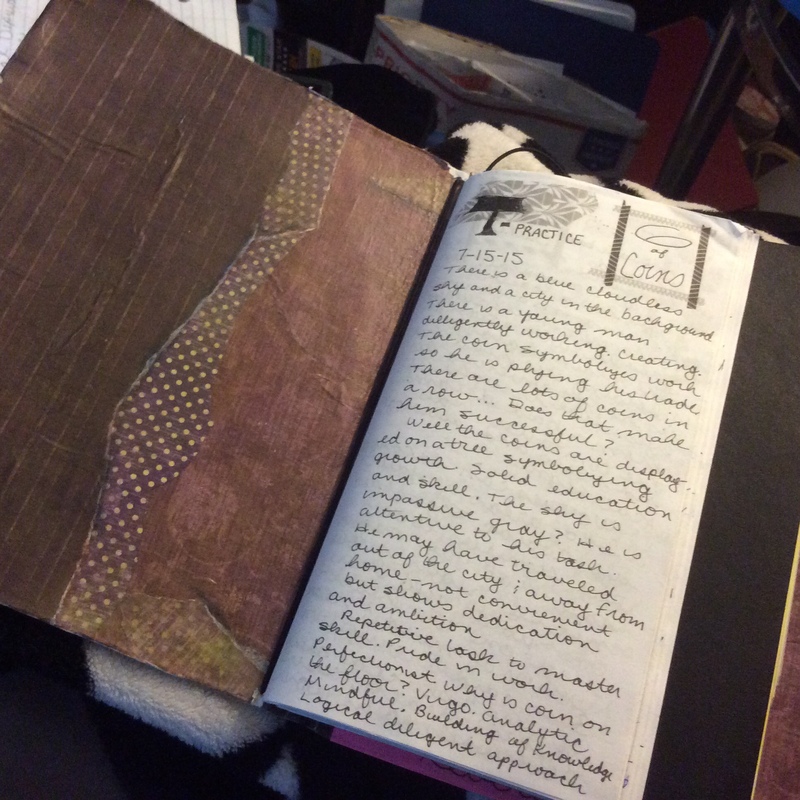 Then add one or two of my other journal as would fit. 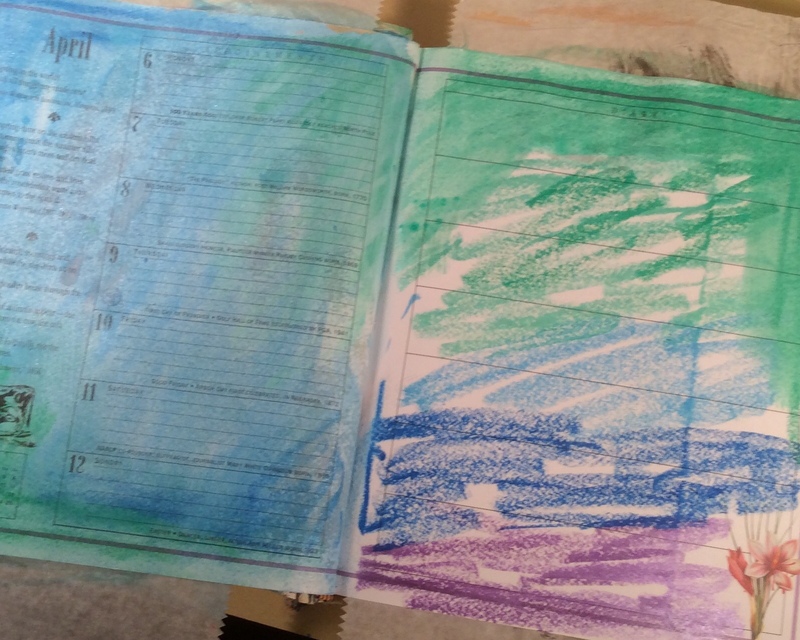 For my working journal, I would use the Midori-like cover for art journal paper pamphlets. Pamphlets similar to the ones made in Teesha Moore’s “How to Make An Art Journal” videos on Youtube: Click to go to Teesha’s Video. 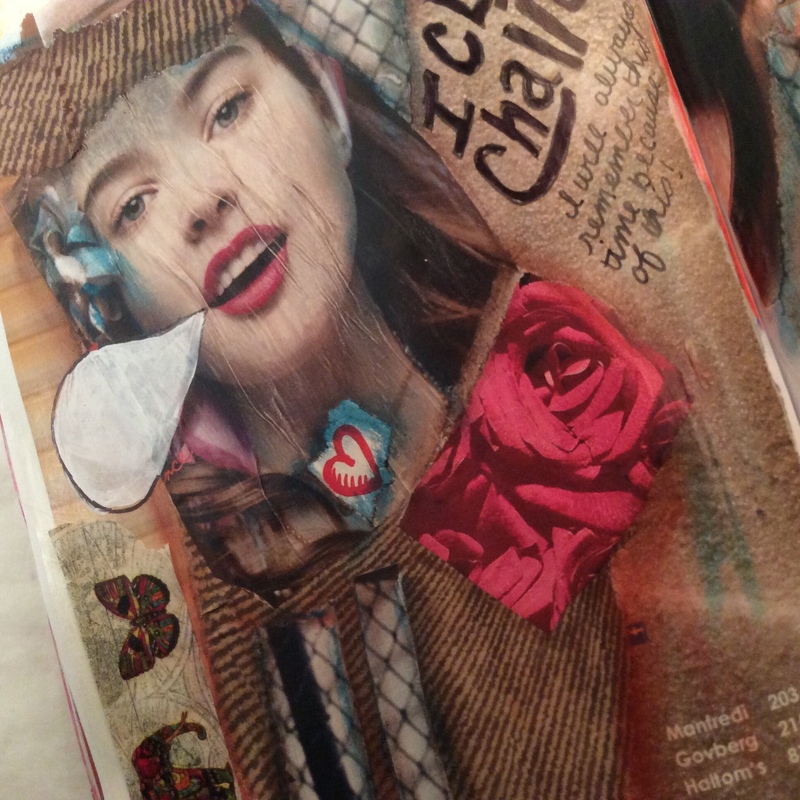 Her Art Journal is super easy to make out of a big sheet of art paper (she uses a specific type of paper – but I have experimented with all different types and have had great results). 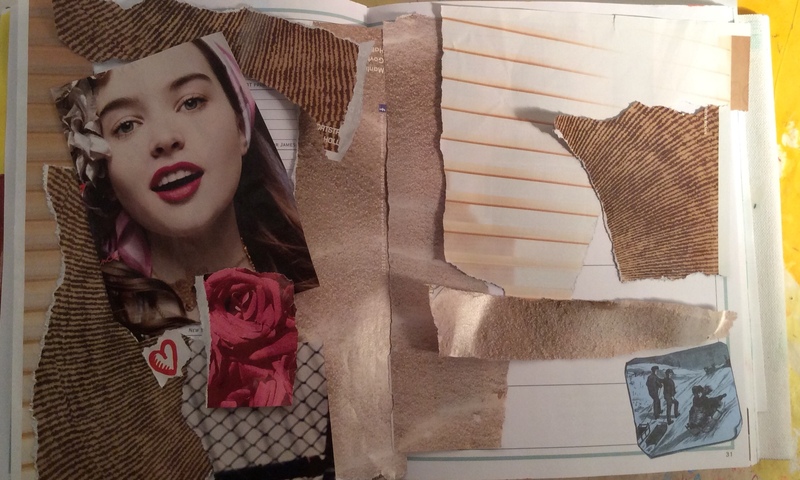 Use each of your Teesha Moore journals as one pamphlet. What is the best is that you don’t need to sew it together. 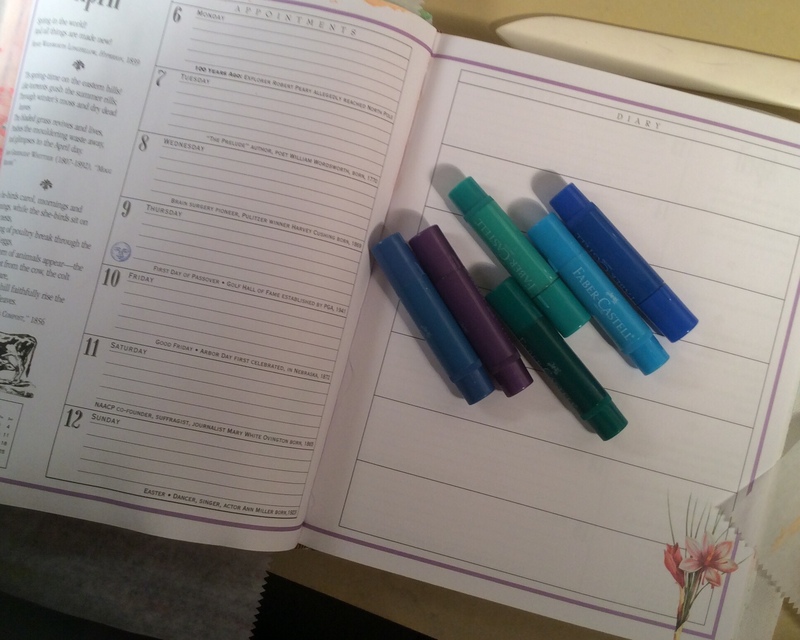 Stick half the journal under one of your Midori-like elastics to hold it not only in the cover but also “binds” the nested pages together. That allows you to move pages at will. You still will be somewhat limited by the pages divided by creases but you will have lots more flexibility to move pages and work with individual pamphlet pages (without being nested together with the rest of the pages). The Midori-like cover would hold lots of those types of journal inserts. Or you could make your insert out of many types and sizes of paper. 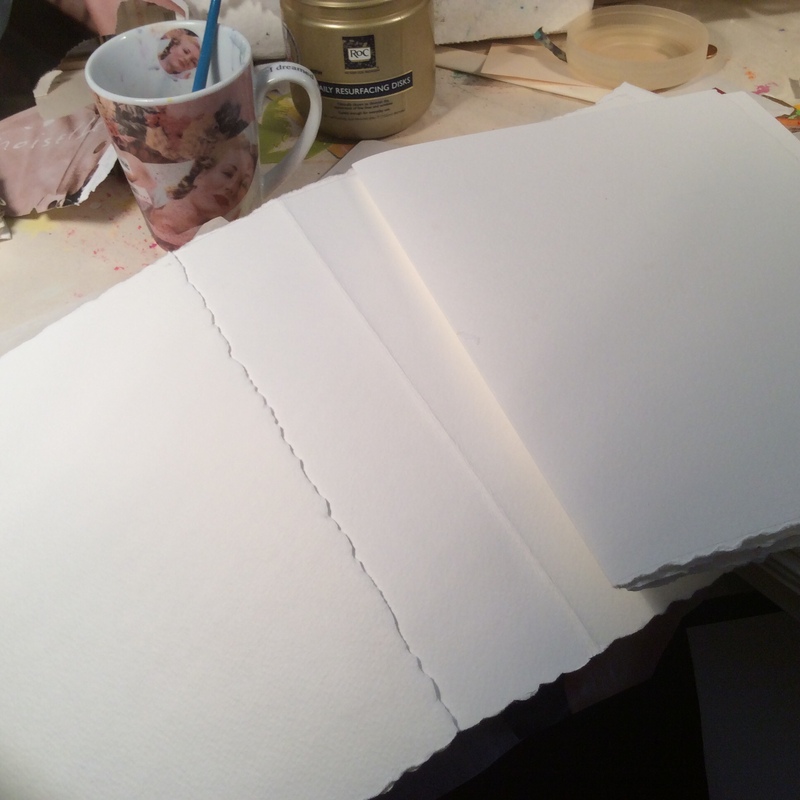 Or even buy a pad of art paper and fold the pages in half using those nested pages to make your inserts. 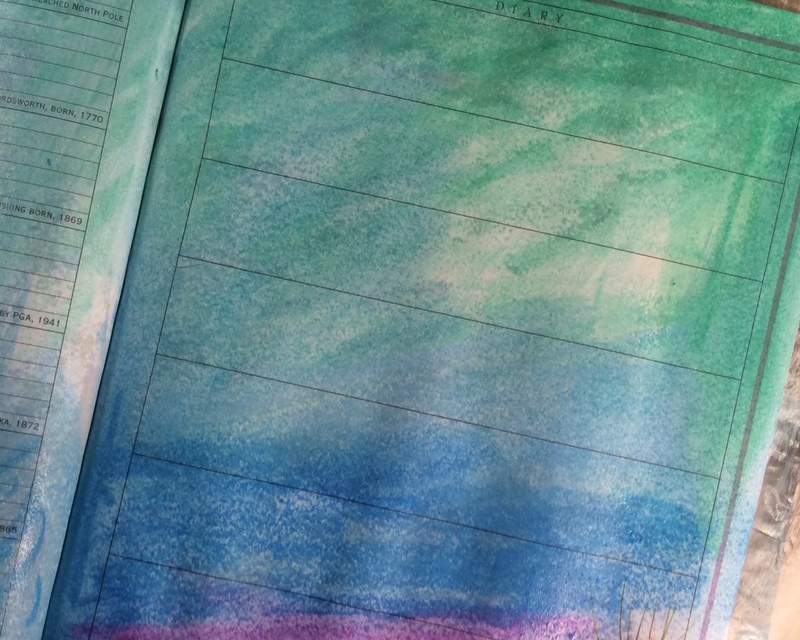 And if you wanted to keep notes, you could also add a lined composition book too, if you wanted. Here is a stack of Teesha Moore style pages. 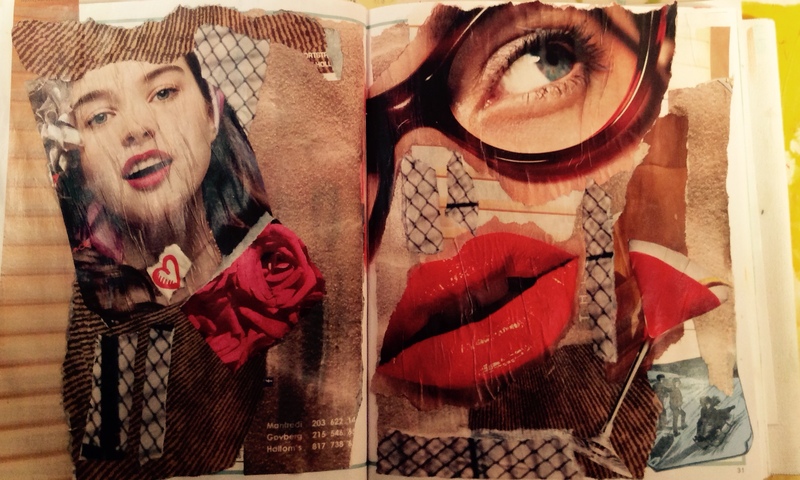 Each piece of paper makes three insert pages that are nested together to make one art journal. 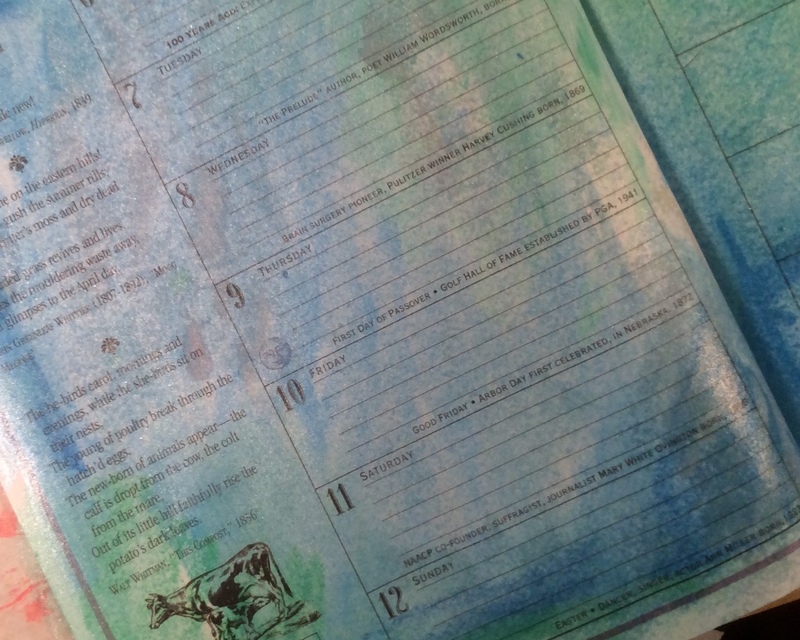 Here are two insert pages getting ready to be nested. 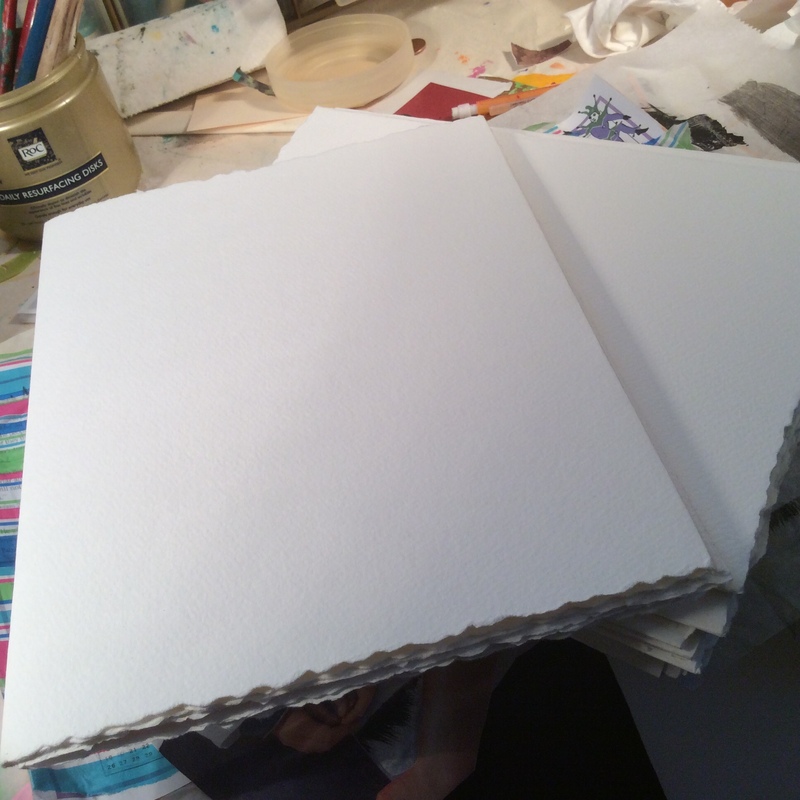 Here is a stack of two art journals, each made from a stack of three of the page inserts. Hmmm. Now all I have to do is figure out the easist way to make one. I have some treated canvas that was supposed to be used to make a painted kitchen floor mat. I could make one pretty quickly using that. 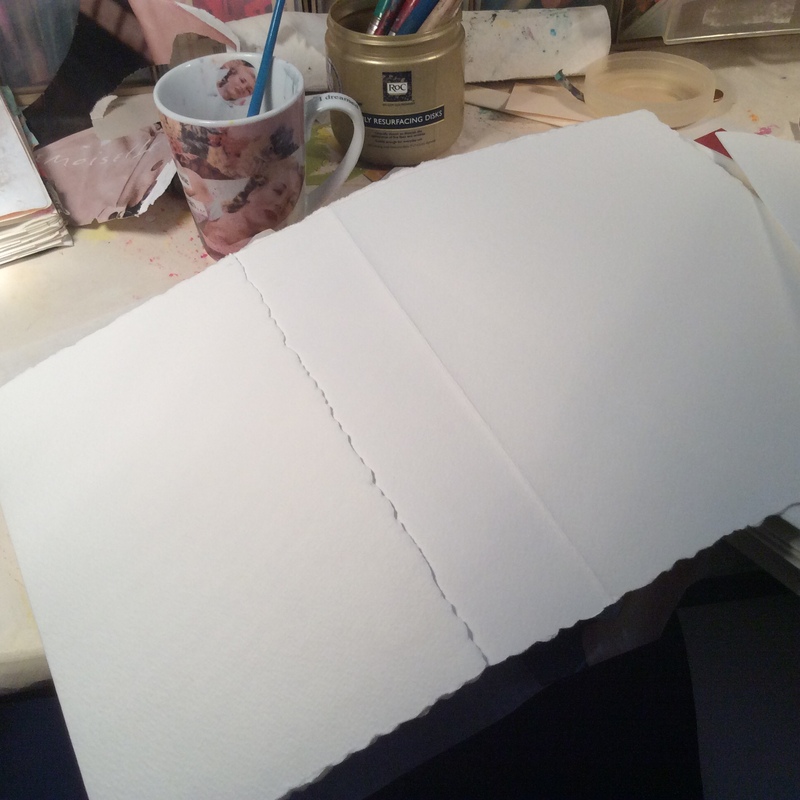 But I would like to figure out how to make a Midori-like cover with simple to get materials with as little sewing as possible, something super easy to make. I will give it some thought. And experiment a little. I will let you know what I come up with! Do you like this idea? Let me know, in the comment section! The last two days I have punked out. I didn’t do my practice. Have not been feeling well. And though I don’t feel so hot today, I wanted to at least do something. I decided to work on a background for a new page. 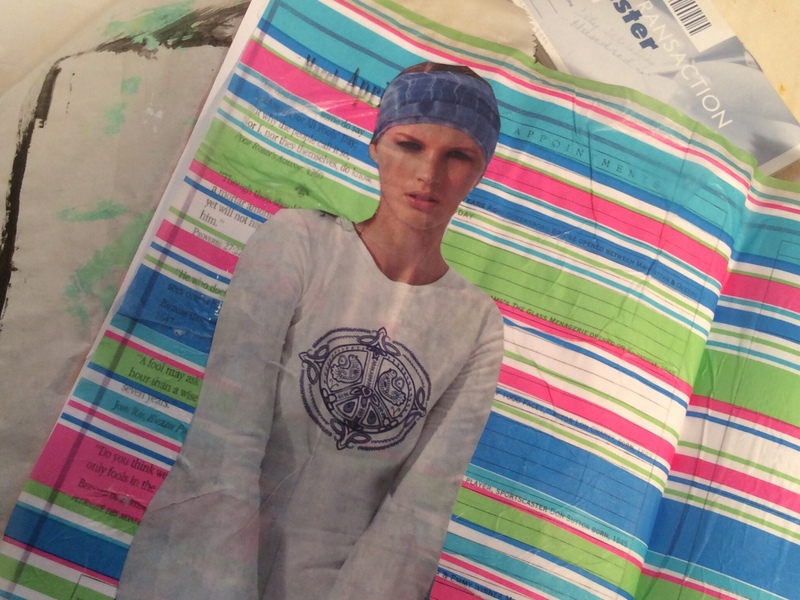 And I wanted to use my trusty brayer. For my first layer I put down yellow. Brayer, brayer, brayer! 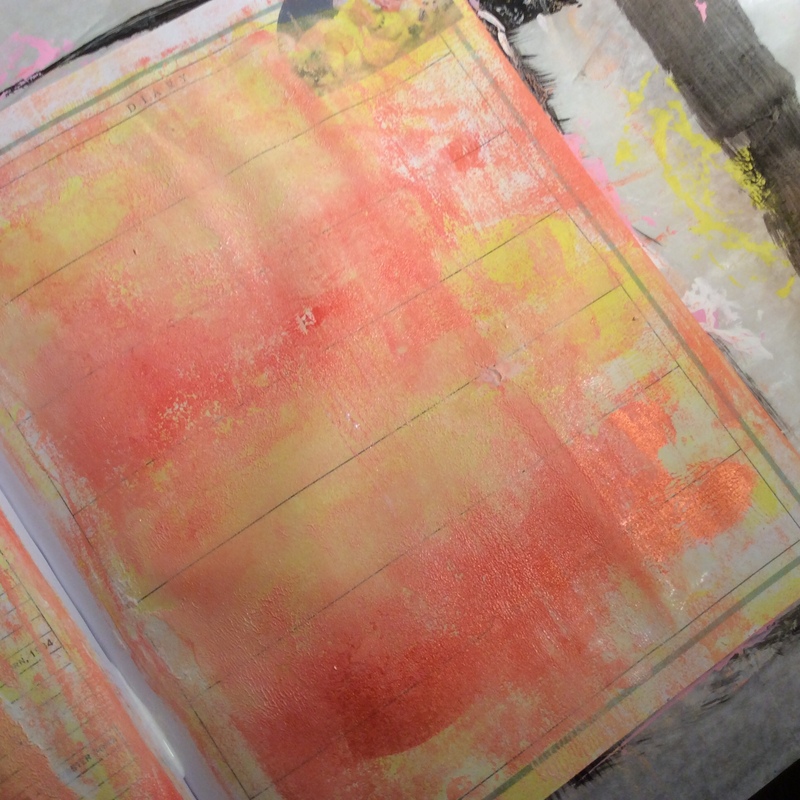 Then I added white paint and brayer again. I want some shine, so I grabbed my metallic orange and brayered it right in. Wanted to add a bit more white but my white paint wasn’t coming out properly so I grabbed my bottle of white gesso. I did shake it but when I squeezed it out I hot a big glob of clear junk. Took a nearby baby wipe and wiped it up. Shook it well again and got gesso but it still seemed a little thin. Brayered it all in. 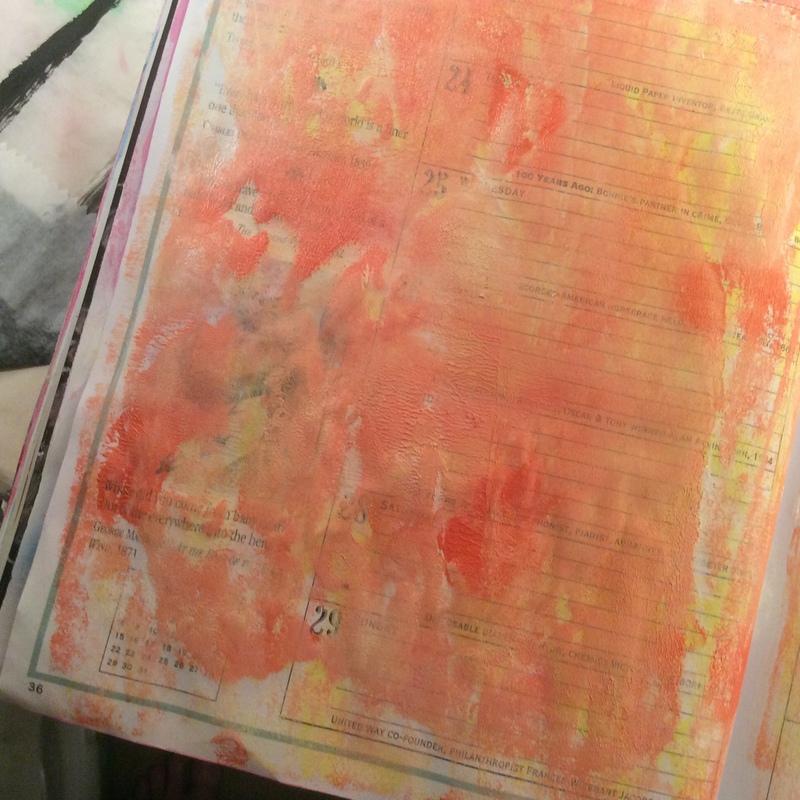 Because I got a lot of white runny gesso over my beautiful metallic orange…I added more orange and brayered it in. I am going to let it dry and see how I like it. 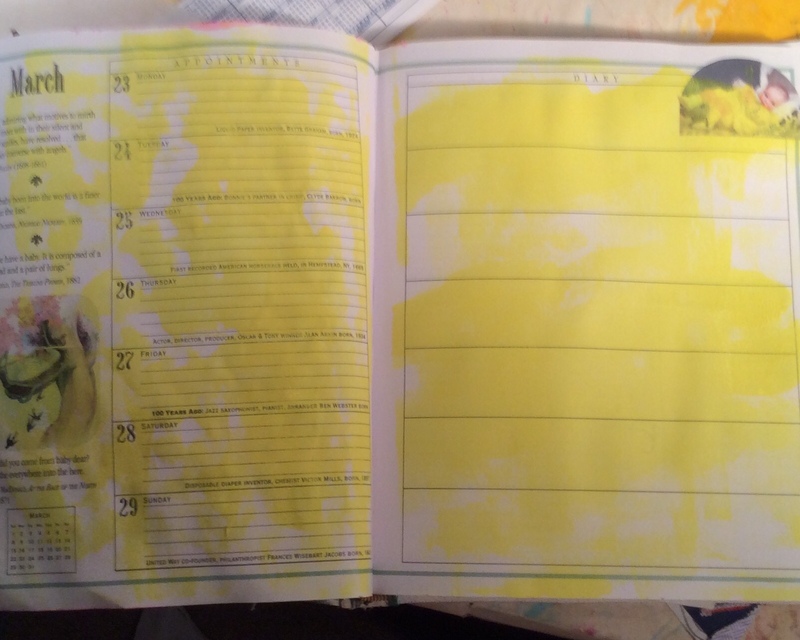 This page looks a bit bumpy because of the glue and paper used on the opposite side. I don’t let it concern me, I just go with it. 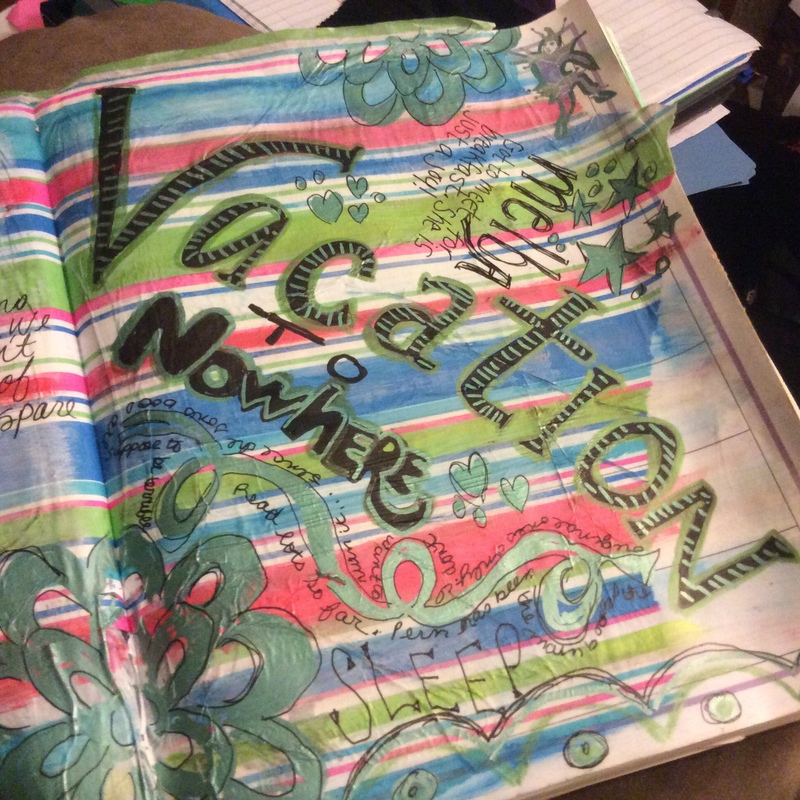 This page came out much smoother because there is nothing on the other side. I wish you could see the metallic sheen better. The shine makes me happy. 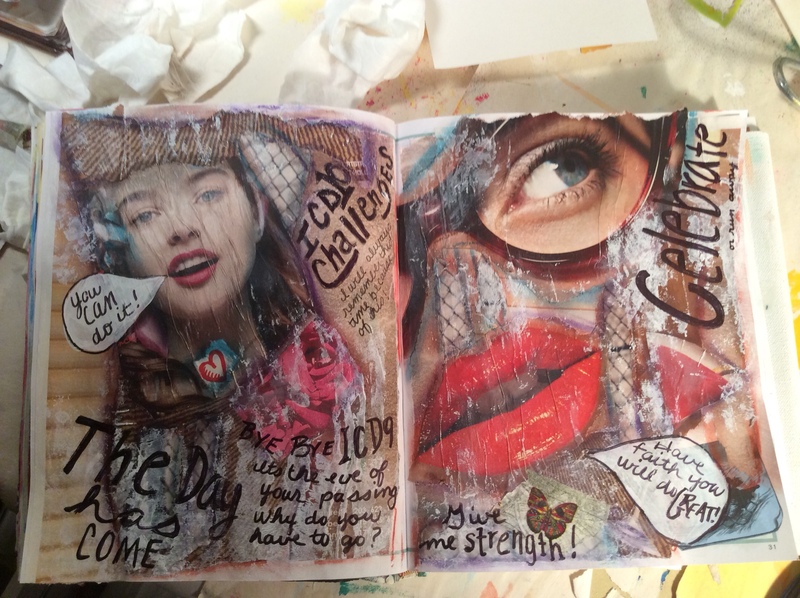 I looked at my spread and just didn’t think that the different bits integrated into the page the way I would like. Normally when I add water soluble oil pastels it seems to do the trick but this time I just wasn’t satisfied. So I got out my white paint and a brayer and started adding a white wash effect. 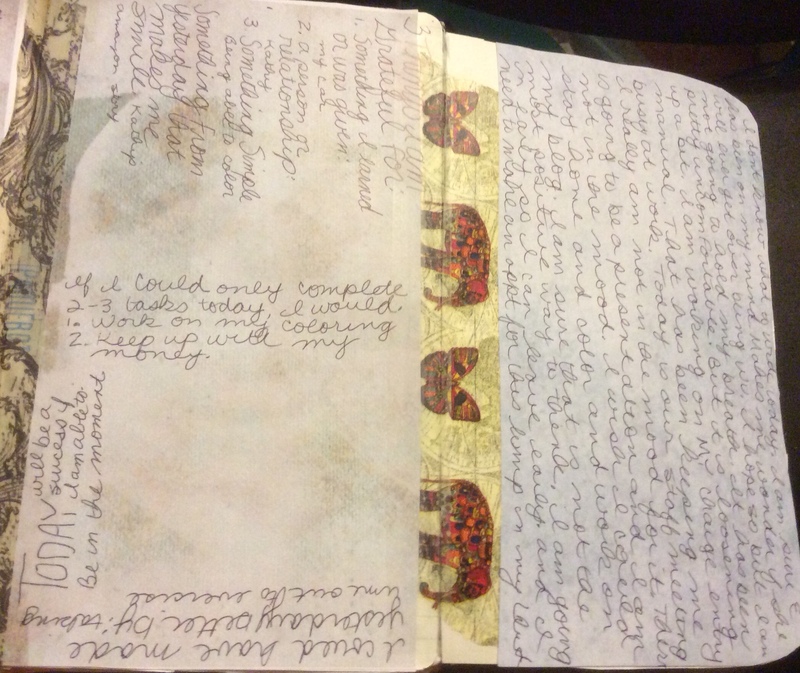 I also added some more journaling. Initially I wasn’t sure how much I liked the white paint effect. The paint did integrate everything together and I am happy with that. I suspect I will finish this page tomorrow by adding a little more pen work. It’s Friday, have a good one! I have started taking a class on Creativebug.com. 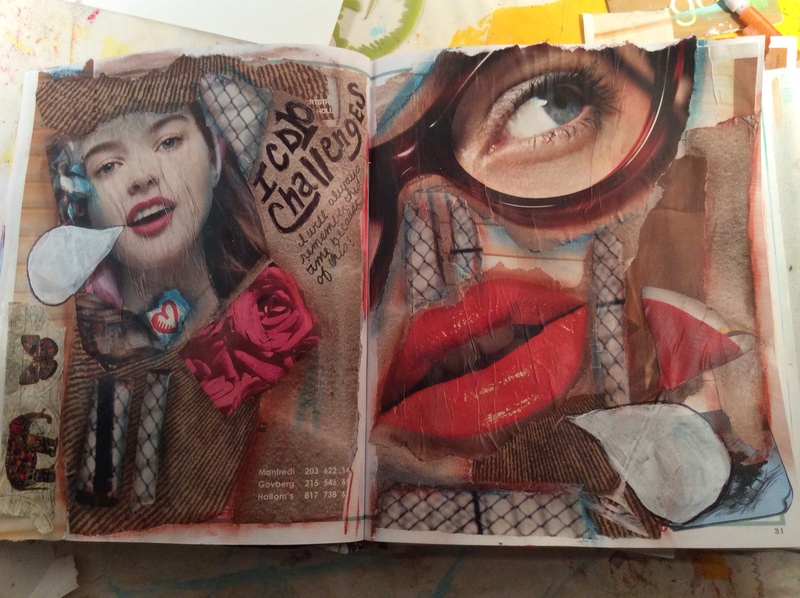 It is Lisa Congdon’s new class More Sketchbook Exploration. I just love Lisa’s classes and this one is no exception. 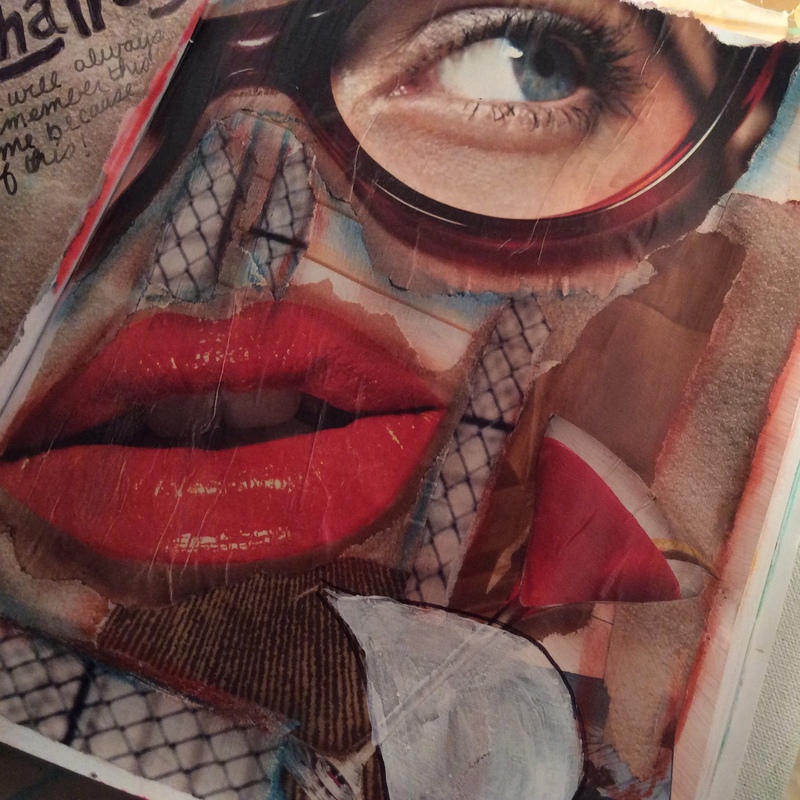 She makes graphic art look effortless and fun. 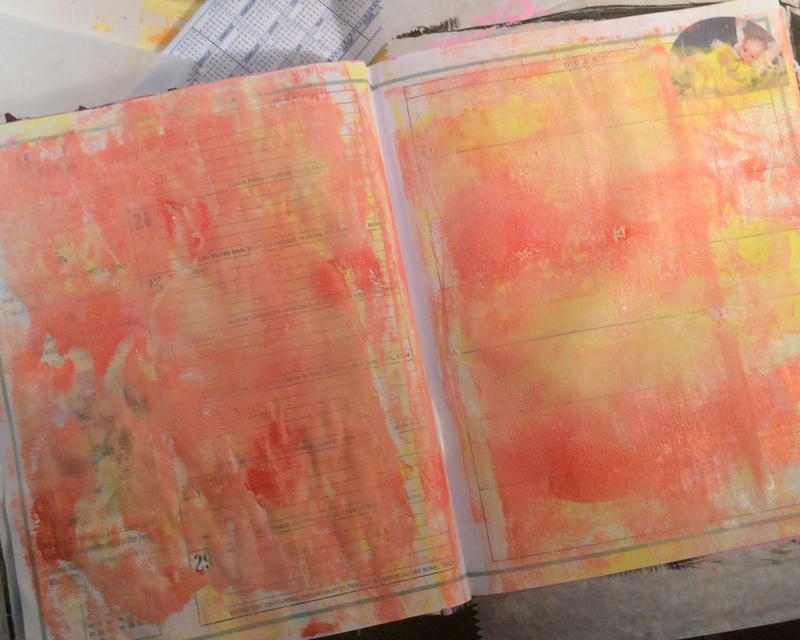 Today’s page is inspired by More Sketchbook Exploration part one. I start by making a background with crayola markers. In her class, Lisa Congdon used Koi watercolor brush pens. I know they would have made the background look more painterly and flow together more easily… but sadly I didn’t have any. 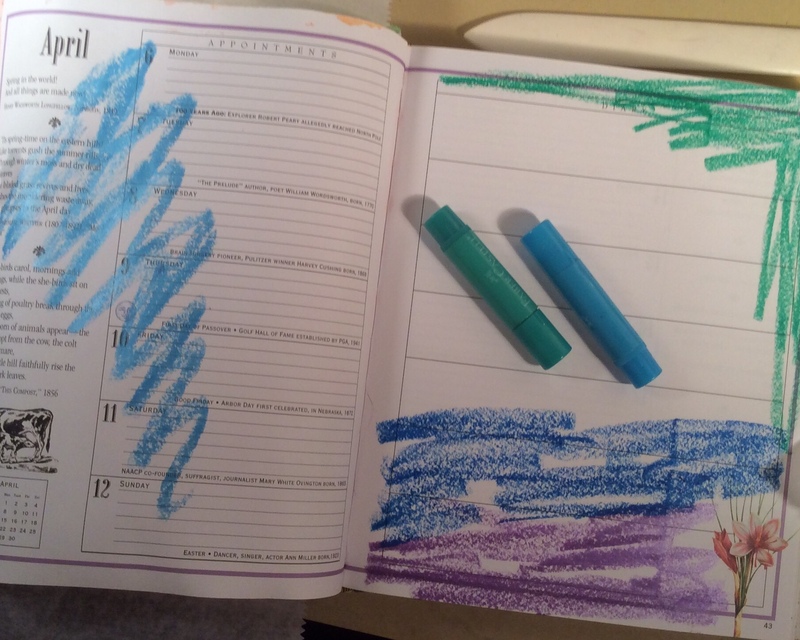 So I pulled out the only markers I had. While Lisa picked a nice palette of light blues, corals, grays and oranges… I ended up using what I had. My colors were much brighter being standard Crayola colors. Still, I did my best to make a cool, colorful background. What do you think? Hope you have a great Friday!